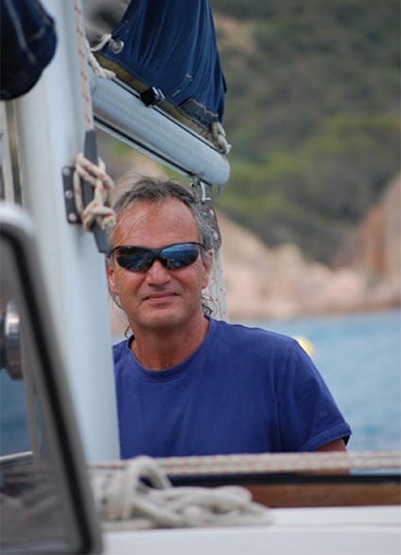 I am Jordi, the skipper of “Anónimo”. When I created Costa Màgica in 1998, it was the culmination of a dream. 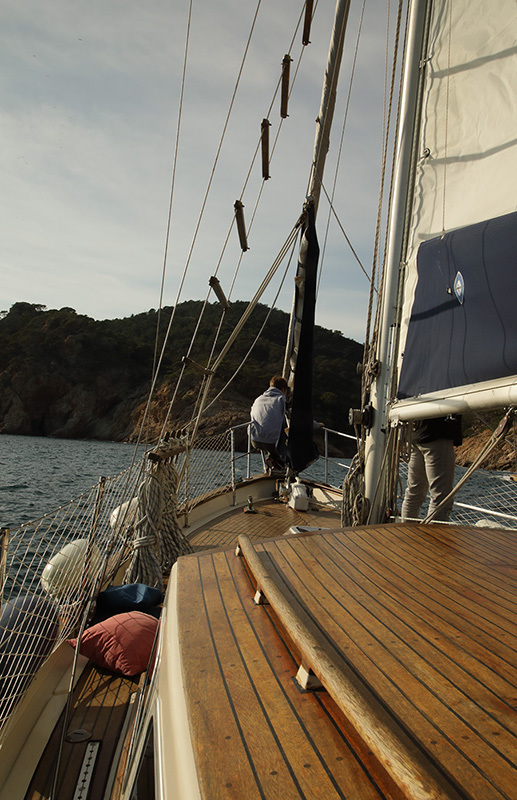 I had a magnificent ketch sailboat berthed in a privileged Costa Brava, and a great desire to sail. Why not share this magic with others? 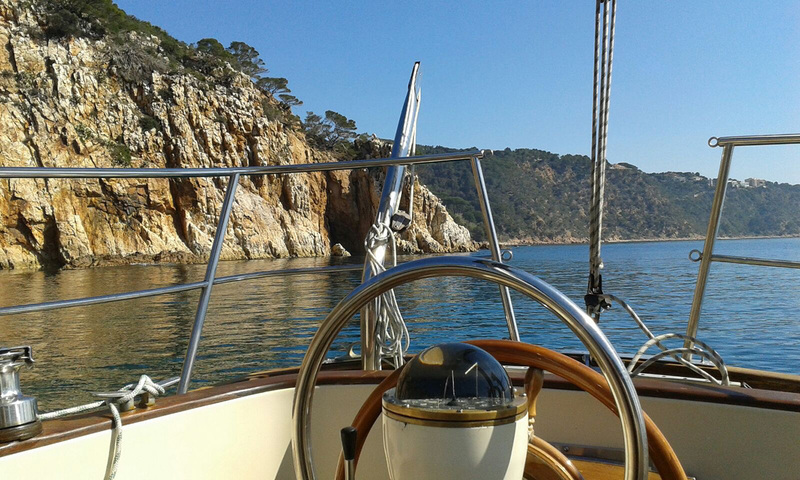 Leaving the port of Sant Feliu de Guíxols, we will discover virgin beaches and coves with clear waters; masses of possibilities to enjoy a different and unforgettable day in the heart of the Costa Brava. 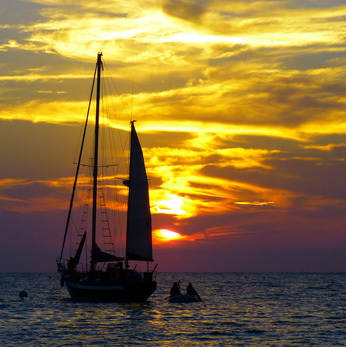 Hire privately the sailing boat with skipper… and sail away! 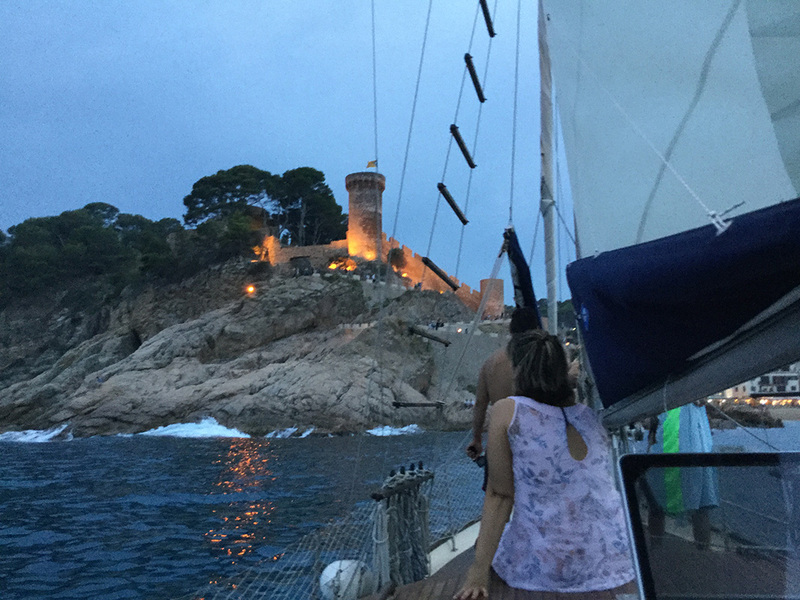 Enjoy the Costa Brava from the magnificent sailing boat of Costa Magica. 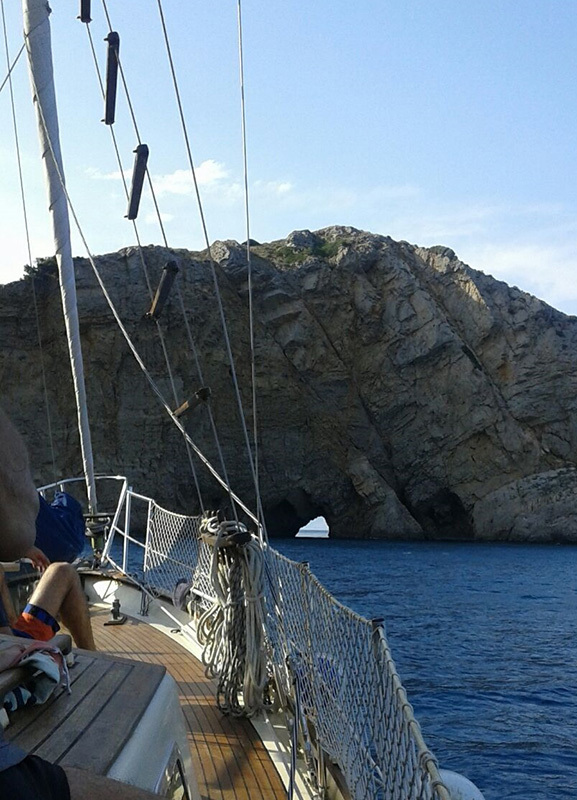 In groups from 2 to 11 passengers, discover caves that are unaccessible, and if you feel like it, swim or go snorkelling in crystal clear waters; or just relax and sunbathe and enjoy sailing from the power of the wind or from the engine. Snack and beverages on board. The boat with its crew, fuel, insurance. Appetizer and drinks on board. Engine: Solé Diesel 55 cv. Shower,wc , snorkel material, music system and speakers… Radar, GPS, plotter, refrigerators… All safety features. up to Cala Morisca in Tossa de Mar. 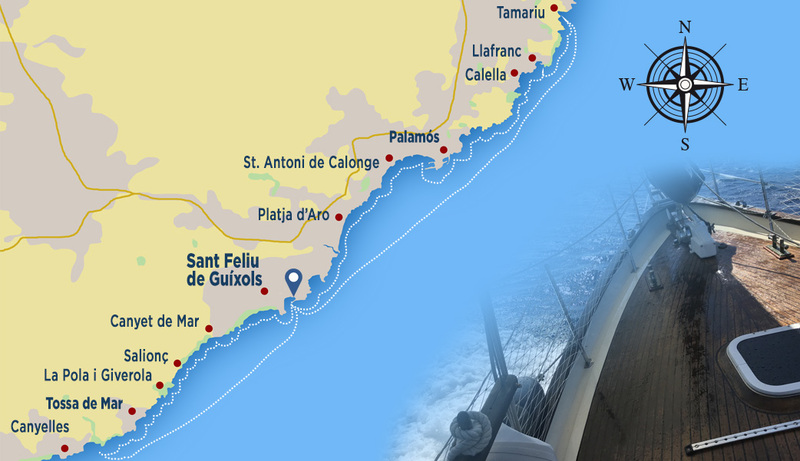 We adapt the route to the duration of the outing and to the sea and weather conditions. Who are Costa Magica’s clients? Families, couples, groups of friends, anniversaries, hen and stag parties, wedding gifts, company incentives. Can anyone sail with Costa Magica? A basic level of fitness and mental alertness are required, although we have had three-month old babies on board, as well as elderly people up to 90 years old. Summer days are usually calm and easier on everyone. In any case, we always adapt to the characteristics of the group, by choosing the best possible route and most suitable type of sailing. We have had many family outings with children of all ages. All that we ask is that they be able to follow the skipper’s instructions, for safety reasons. Footwear with soft rubber soles and comfortable clothing, suitable for the time of year. In summer, a towel, headgear, and sunscreen are advisable. 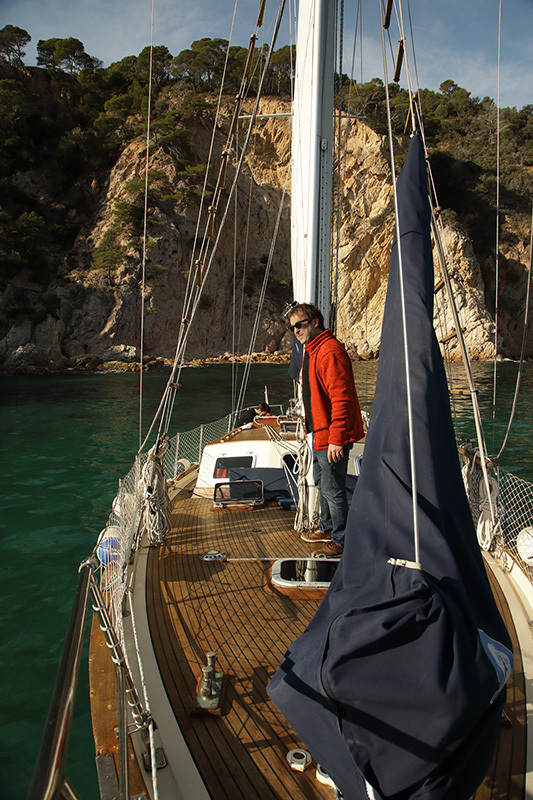 On board you will find sailing jackets and mats for sunbathing. I tend to get motion sickness. Should I come? Except for some days of total calm, there is always some motion on a sailboat, which makes it unadvisable for people who suffer from motion sickness. In some cases, a preventive motion sickness tablet can solve the problem. Motivation is very helpful! There are nine of us, and two more who are considering joining us. Should they come? Out of experience, we would advise them to stay behind. 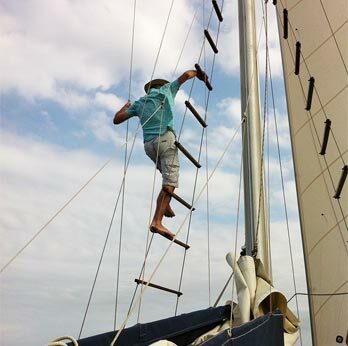 Motivation is essential to overcome the minor discomforts of a sailboat, while allowing one to experience unique moments. 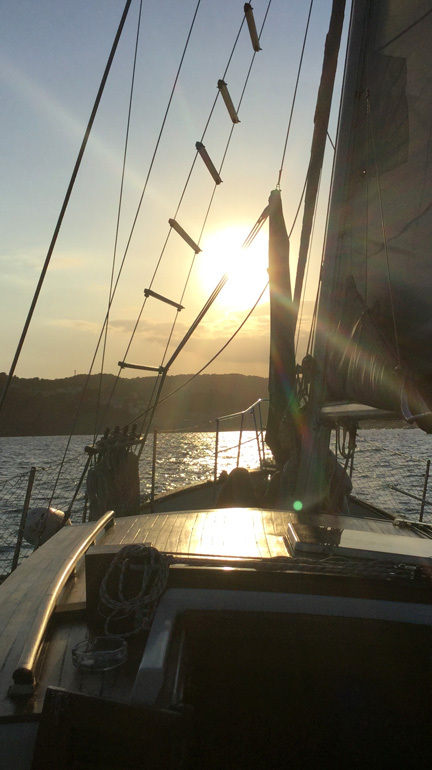 Do you recommend the 4-hour trip, the 8-hour outing, or the evening sail? Time takes on a different rhythm at sea. Everything moves slower and takes longer than on land. The four-hour trip offers a taste, and can be enough for some people. It may also be the only option for those with time constraints (high season). What routes do you follow? • ROUTE S/W: Sant Feliu de Guíxols, Punta d’en Bosch, Canyet, Sr. Ramon, Futadera, Giverola, Pola, Bona, Tossa de Mar, Llorell and Cala Morisca. • ROTE N/E: Sant Feliu de Guíxols, Sant Pol, Palamós, Castell, Illes Formigues, Calella, Llafranch, Tamariu and Aigua Blava. Can we choose the route? 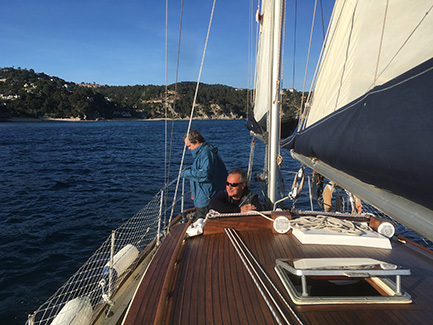 Our standard practice is to head southwest on a first outing, as this route offers more options for comfortable anchorages and a favorable sail back with tail winds. We can head northeast on a repeat outing, if the forecast is favorable. Can we choose where to drop anchor? 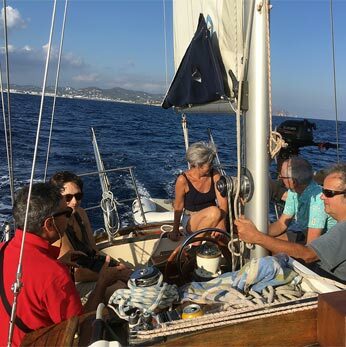 During the outing, we will always select the best anchorages based upon the wind and conditions of the sea; whenever there are several equally favorable options, the skipper will offer you a choice. Like any other outdoor leisure activity, this one is open and flexible. Is it possible to return early? Of course; more does not always mean better, and each case is different. Will we be able to return later? Unless we have consecutive reservations (high season), our schedules are flexible and if the conditions are favorable, we are willing to adapt, especially with repeating clients. Can we set off later in the morning? With prior warning, the 10 a.m. start of the eight-hour outing can be delayed. However, we strongly advise a 10 a.m. start to take advantage of the morning calm, especially during the summer season. Will we use the sails or the engine? 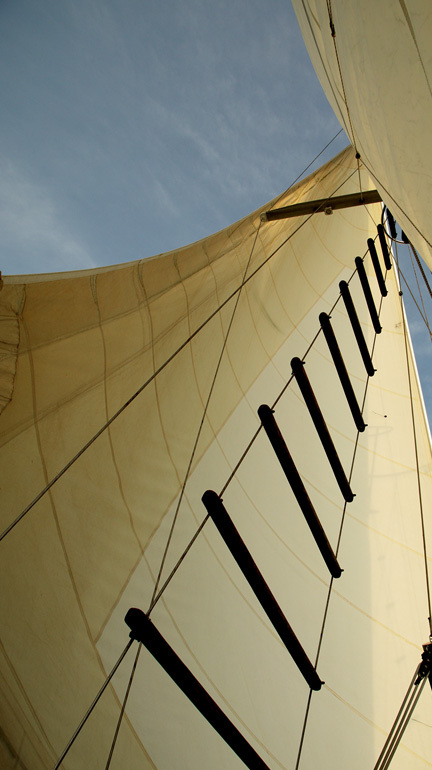 On board of Costa Magica’s sailboat, the mainsail and mizzen sail are always up, because they help to stabilize the boat’s movement and they provide shade. 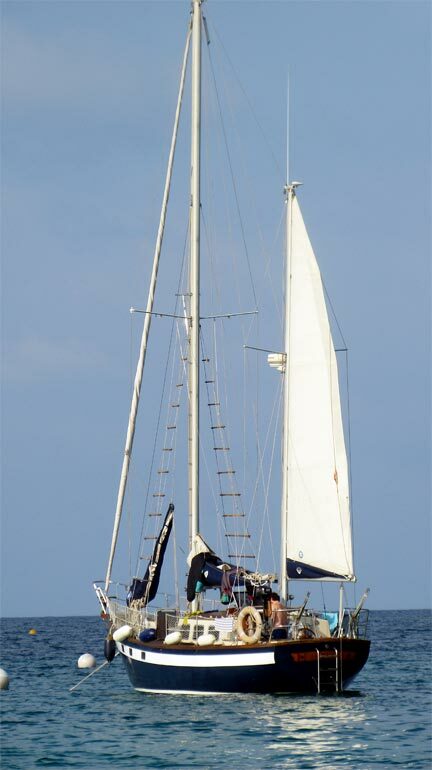 Part of the trip will combine sail and engine power, but if the wind conditions allow it we will sail. Will we be able to swim? You will be able to swim during every stop — there are two during the four-hour trip, and three or four during the eight-hour outing — using the stern ladder or jumping off the ratlines. We offer a freshwater shower, and cabins to change in. We have a music system on board and you are free to bring your own iPods, favorite cd’s, or a portable music system. If you bring your own fishing tackle, you will be able to fish among the rocks during our stops, or troll (draw a lure and a line through the water) on our return sail, from one to three nautical miles from the coast. What does the snack include? During all of our outings, we serve a snack at the first anchorage, consisting of Catalan bread and tomato with cheese, cold cuts, olives, dried fruit & nuts, and beverages. We recommend bottles of water or fruit juice. Beer, shandies, soft drinks. Red and white wine. Can we bring food or beverages of our own? Of course; you can bring cakes, cava (champagne), or other accompaniments for celebrations. Where can we order meals? By telephone, giving the day, number of passengers, and choice of outing (4h./ 8h. / evening). In certain cases, 40% of the reservation will be payable. Yes, Children under 10 of age: ½passenger. We are only two people, and we don’t want to hire the boat by ourselves. The ideal option is share the outing with a group of people who know each other. In high season it is possible to form more diverse groups, although it is not always easy to find compatible dates and availability. What if the weather conditions are bad? An outing can be cancelled due to rain, heavy seas, or strong wind. Nevertheless, the concept of bad weather can be relative. Some clients may find days with strong breezes very appealing, while others will prefer calm days. At Costa Magica we cannot control the weather, but we are willing to be flexible and to make every reasonable effort to avoid disappointments. If, after discussing the conditions with the skipper, clients choose not to sail, the outing can be cancelled and postponed for a later time or date, based upon mutual availability. What if the weather is fine when we leave, but turns bad? We will return early and you will pay a proportional rate. At sea, flexibility and timeliness are essential. What if the sea conditions are fine but the sun is not shining? While some clients may find a lack of sunshine annoying, it is not reason enough to cancel an outing. Many will find that, especially in summer, periods without sunshine are a relief. How much anticipation is required for the reservation? If the sailboat is available, reservations can be made up to 24 h. before departure. Of course, the sooner you make a reservation, the greater your chances of the date in question being available. Many repeat clients reserve summer weekends months in advance. What day(s) do you recommend? In summer, weekdays are always better, and the least busy day is Monday! Will the boat be the same as on the photographs in the leaflet and on the website? Yes. The “Anónimo” is Costa Magica’s sailboat, a 35-foot ketch built by Belliure.